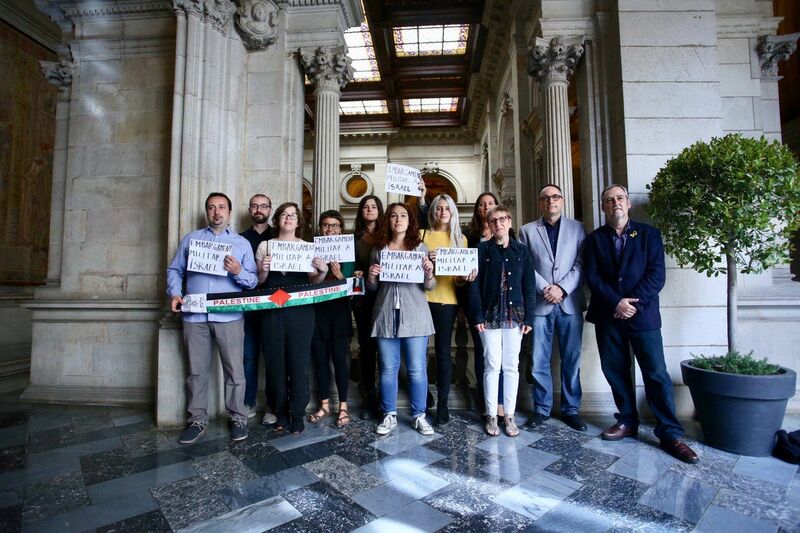 On 25 May, with the support of an overwhelming majority of its members, the Barcelona City Council called for a comprehensive military embargo on Israel and demanded the Spanish government ensure its implementation. This constitutes an important precedent and a major step forward on the way to end international military and security ties with Israel, until it complies with international law and respects Palestinian human rights. Barcelona is so far the largest city to heed the call of Palestinian civil society for an end to arms trade and military and security cooperation with Israel’s regime of apartheid, settler colonialism and occupation, similar to the one applied against apartheid in South Africa. Five out of seven political parties in the Barcelona City Council, Barcelona en Comú, Candidatura d’Unitat Popular, Esquerra Republicana de Catalunya, Partit Socialista de Catalunya and Partit Demòcrata de Catalunya, as well as the non-affiliated councillor Gerard Ardanuy, supported the declaration. Support the resolution of the Human Rights Council of the United Nations on March 23 [calling for an international investigation of the latest killings] and the demand of Amnesty International and the Barcelona Co-operation Council for states to impose a comprehensive embargo on the sale of weapons to Israel - in compliance with the EU code of conduct on arms exports - thus guaranteeing the defense of human rights and international humanitarian law, and urge the Spanish government to guarantee this embargo. The City Council of Barcelona calls on the EU and the UN to ensure that Israel complies with the International Convention on the Rights of the Child and releases the 400 Palestinian children currently in prison. It also condemns President Trump’s decision to move the US embassy to Jerusalem, underlining that this move contradicts international law and UN Security Council resolutions. The declaration, promoted by Barcelona’s mayor Ada Colau, has been forwarded to the government of the Spanish State, the EU and UNRWA. The Barcelona City Council position was widely supported in civil society, including by the Federation of Organisations for Global Justice, Amnesty International and ‘Stop Complicity with Israel’, a coalition of more than 20 human rights organisations and social movements which is part of the BDS movement for Palestinian rights.